Battling Stink Bugs - How To Fight Back Against The Ultimate Pest! When it comes to battling stink bugs in the home, the fight got very personal a few weeks back. Way too personal! It was a beautiful Saturday evening. Actually, one of the few we have had during this so-far, very rainy, cold and sometimes snowy start to the year. It was supposed to be a relaxing night. We fired up the grill and made a wonderful meal. Next, to make it a little better, we poured a glass of wine for each of us to enjoy. We sat down at the dinner table, and then it happened. I knew the moment the wine left the glass and into my mouth that something was wrong. And instantly, our wonderful evening dinner was ruined. Somehow, someway, a dreaded stink bug had made its way into my wine glass, and then into my mouth! It was simply awful. It’s actually still hard to write about it without getting queasy. Not only did I nearly swallow the nasty creature, it also decided to leave its trademark “stinky smell” when it entered my mouth. I spent the remainder of the night brushing my teeth 2000 times, following that with at least 100 mouthwash rinses. It is a taste and feeling I will have nightmares about forever! Battling stink bugs, or Brown Marmorated Stink Bugs as they are officially known, has become front and center for millions around the country. They arrived years back as unwelcome, hitch-hiking guests from China on container boats. Ever since, the insect has simply flourished and spread like wildfire. 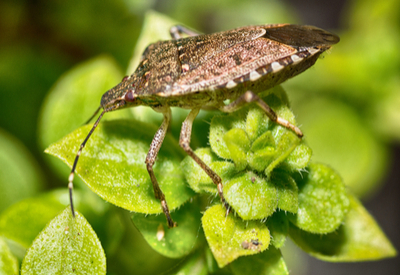 The bad news when it comes to battling stink bugs – they have absolutely zero natural predators. Birds and other insects want no part of them at all. The same goes for pets. Our dog leaves them completely alone, learning quickly the horrifying smell that accompanies the bugs when they are messed with. 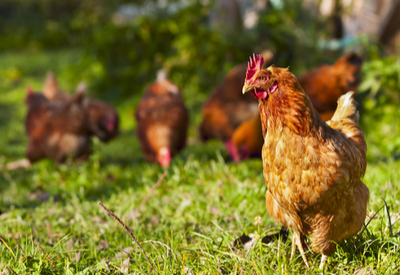 Even our beloved chickens, the most accomplished insect eaters of all, turn their little beaks away when one passes by. As for pesticides and sprays – if you were to choose that route – they are simply impervious to their effects. With that said, there are a few things you can do to help alleviate them from your home. And they can go a long way toward keeping the nasty creatures under control. Seal, Seal, and Seal Some More! 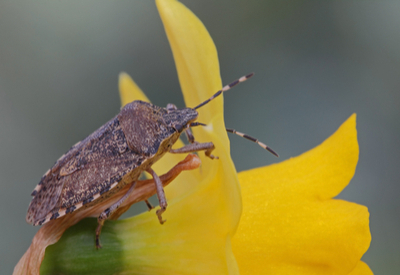 When it comes to battling stink bugs in the home, the best offense is a good defense. The most important task to control them is to seal off their entry points to the home in the early fall. As cool weather approaches, stink bugs look to find shelter until spring, when they emerge to head back outdoors to mate and live. Stink bugs will find the smallest of cracks to enter and hide. Be sure to seal windows, door thresholds, as well as cable lines, air conditioning lines and vent spaces into the home. This is where they sneak in, and sealing them with caulk will make a huge difference. If you need proof, remove a door threshold or a piece of window trim and see how many are living a happy life underneath. Also, be sure to seal off spaces inside the home where they hide! Trim work, base boards, and small cabinet crevices are the stink bugs number one choice for a hiding spot. Eliminate those places, and they have a hard time finding a home to live out the winter. Here is to fighting the good fight, and keeping stink bugs out of your wine! Jim and Mary. To receive our 3 Home, Garden, Recipe and Simple Life articles each week, sign up for our free email list. You can also follow us on Facebook, Twitter, Pinterest, or Instagram. This article may contain affiliate links. Thanks Jack… let us know how it works! We live in the southwest part of Ohio and we get more than our share of stink bugs. I read an article that if you take a empty coffee can, don’t rinse it out. Stink bugs must like the smell of coffee. Place duct tape ,sticky side out on the outside of the can . When the stink bugs land on the tape they get stuck. Then you just through the can away. I am going to give this a try and let you know how it goes. The “stink bugs” we deal with (in Vermont) are actually Western Conifer Seed Bugs. They are similar in appearance but are actually native to North America. They are the same kind of pest – crawling out of cracks on warm days. They only positive is that their “stink” is not so bad (relatively speaking) – rather like decaying apples…. I am horrified over this story! Skretching and screaming because it was in your mouth! Oh my Lord NOOOOOO!! I am please to hear about the soap working. I will have a soapy spray bottle that I will use on them this spring. I did notice 2 years ago after I sprayed heavily for all bugs that they were lessened. I hated doing it but I could not have the wolf spiders in the house and they were pretty bad. Saw my first stink bug in Pasadena,California in 2015 and was disappointed to find them here in Louisville, KY where we now live. I believe it would be virtually impossible to seal off every possibly entry point for them and I think I’ve killed about 30 in total since the cold weather began. They are really rather dumb in that they just stand still and allow themselves to be grabbed up in a tissue, napkin or paper towel. Once out of my sight, I just squish them quickly – Their hardish shell makes for a satisfactory confirmation of destruction and then I throw them away completely satisfied that they are not coming back to life. Not a big deal, just annoying. Getting one in my mouth however would certainly be a different story! Ew that is DISGUSTING! They come in my house every year here (and everyone else’s, too), and it is such a battle keeping them out. I am finding them in the master bedroom this year, and I am scared that there is some new hole giving them access. I hope my roof is OK, sheesh. I do take great joy in flushing them down the toilet when I find them, though. It’s the little things. We find maybe 2 -3 a week in our home in Northern Ohio. I must admit i find pleasure in throwing them into the woodburner. Terrible right?? Spraying works, sort of. And it leaves a really nasty sticky residue wherever you spray. We have a small waste basket with 2-3″ of water and a tsp-tbsp of dish detergent during the ‘season’ – and whenever we get a warm day. We also sent away for some sort of pesticide that we use to spray the outside of the house, inside the walls whenever we open one (we’re renovating the house, and replacing some of the walls and windows), inside the attic. Also with the renovations, we’ve been sealing EVERYTHING – not just for the stink bugs, but for the drafts too. We also have bug zappers which are pretty effective too. We keep at least 1 in the attic. We are hoping that soon (in the next 5-10 years ???) we’ll have them fully under control. I read somewhere that by killing just one stinkbug, you’ve prevented 8 generations from flourishing that year. Fortunately we don’t have stink bugs here at least not yet but we do have other flying friends that like to dive into a glass of wine outdoors. I purchased some silicone coffee cup lids that fit on the wine glasses perfectly and keep unwanted swimmers out. I love the soapy water idea! I usually send the stink bugs on their way outside, a little more gently than they deserve, because I hate the smell and I hate killing things. It’s terrible for the environment to let them live, though. Soapy water is hands-off enough to solve these problems, but I still feel a bit guilty. Me and my bleeding heart, ugh. And they do have one predator – house spiders! Whenever I’ve seen a house spider get a hold of one, that thing THRIVES and gets huge. I’ve seen the prettiest spiders with stinkbugs in their webs. Sadly, there are too many stinkbugs and they are very hard for lil spiders to tie up. So soapy water it is. We hardly ever have them inside and if we do it’s like one or two–not to the point of the pest category. That being said, we do get the squashes and pumpkins in the garden; first on the leaves then on the fruit. What can be done there to get rid of them there in the garden? When I find a live stink bug in the house, I slowly, carefully pick it up on a piece of paper so it doesn’t stink and throw it in the toilet. (Just the bug, not the paper.) Whoever is next in the bathroom automatically takes care of the problem! If putting them in soapy water kills them what about spraying them with a soapy water mixture? Or would it dry up before it could have any effect?